Public parking available adjacent to the restaurant with handicapped parking at the entrance to the restaurant. We are convenient to the Citizens Area Transport routes. Taxi and limousine services available from the Strip and other parts of Clark County. Sunday, 6:30pm to 9:30pm, enjoy a variety of talented singers/guitarists. Both on-site and off-site catering available for parties and private events of 10-200, including wedding ceremonies and receptions. Beautiful indoor and outdoor venues available. We can prepare one-of-a-kind delights for that special event. For wine connoisseurs, specialty off-site wine tasting and food pairing events are available. 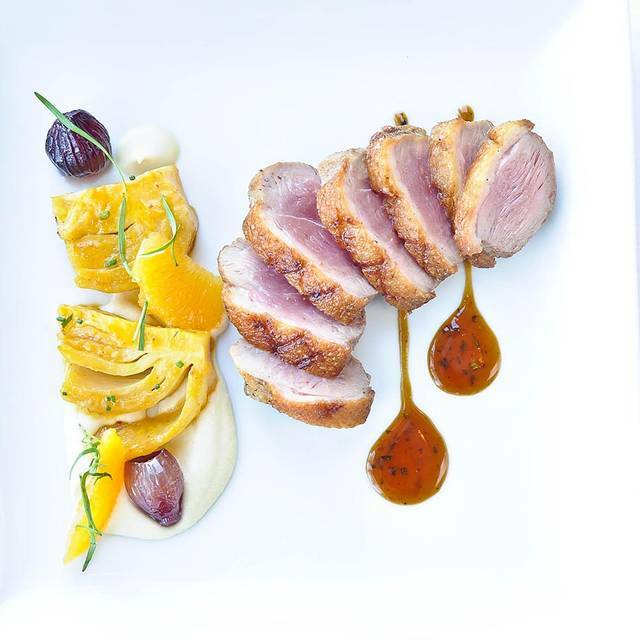 Awarded TOP 10 Vegas Restaurant by "Eating Las Vegas: The 50 Essential Restaurants, Best Vegas Outdoor Restaurant, Best French, Best Wine List and Best Neighborhood restaurant, Marché Bacchus serves contemporary French cuisine featuring a large variety of seafood and meats in a comfortable and casual environment. You can select from romantic lakeside patio seating along a serene lake or a beautiful dining room with windows overlooking the lake. 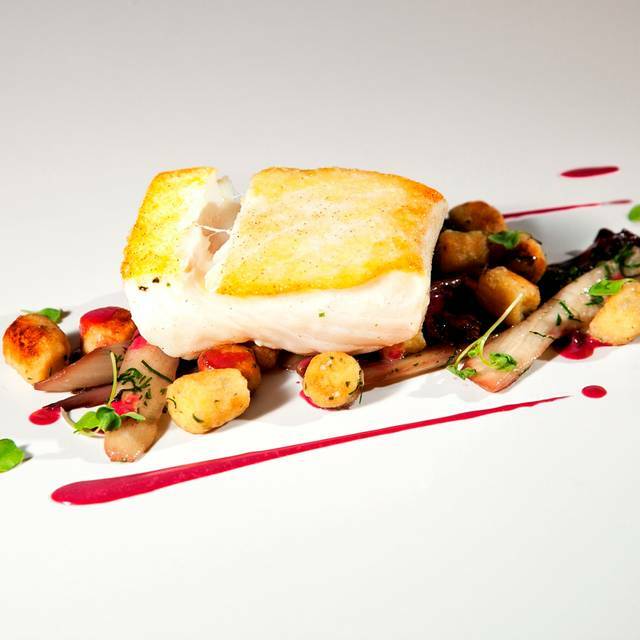 Our cuisine is the creation of Executive Chef, Tom Moloney, and Consulting Chef, Luciano Pellegrini, formerly of Valentino. 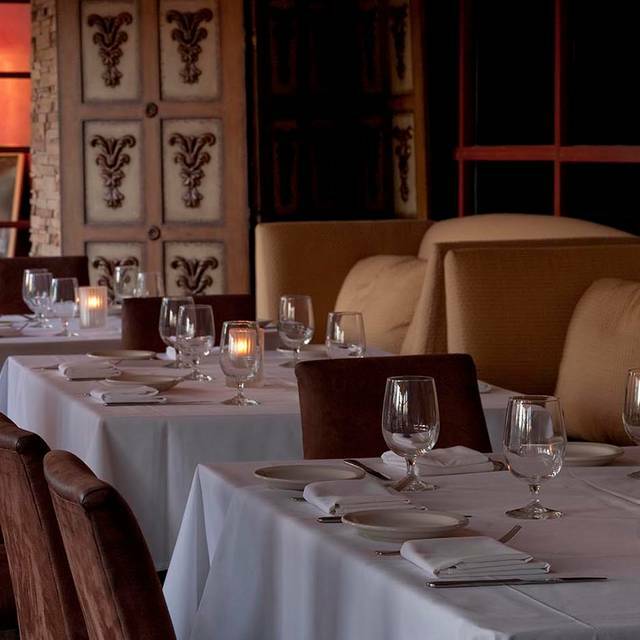 The wine list is among the best in Las Vegas, with over 950 labels to select from. Perennialy proclaimed as one of the best restaurant wine values in the United States, all wine selected from our retail wine store can be enjoyed at the table with a $10 corkage fee. Ordered Chicken mushroom Crepes which were shriveled and cold. Had to flag down waiter to request a reheat. The chef prepared fresh plates, and food was warm and good. The house salad on the first plate contained tomatoes. The replacement plate did not include tomatoes. The manager comped desert. The deserts were excellent. Not sure why the chef did not prepare the first order fresh vs reheated. Not sure why the waiter didn’t notice the problem before she delivered the orders to our table. Ambiance was great. Wine was good. Terrible band disco music next door. Outdoors needs maintenance. As usual, Marche Bacchus was exceptional. This is an excellent venue for any special occasion. Not only was the food delicious, but the service was hands down the best. My girlfriend and I were trying to find a nice bottle of white wine. Not finding what we wanted, we mentioned it to the front door staff. Without hesitation, she came back with a couple of bottles. Marche Bacchus was recommended to my family by my cousin who previously lived in Las Vegas. We had an absolutely delightful lakeside lunch there. The service was great (very attentive) and the food was fantastic. We will absolutely go back. On our way out, we had a lovely conversation with the owner. Instantly one of our favorite restaurants in town. When the four of us were at Marche Bacchus, the service was excellent, the food was very good, the wines were many and the ones we had were excellent (we picked them out), and the ambiance was excellent with views of the water and an occasional "honk" by a goose. A good place to chat without loud music. Our reservation for 7:00 was not honored. We were asked to wait a few minutes without explanation. The was no place to sit except at the bar. We didn’t want to order at the bar, so we stood there. The hostess checked the dining room, and told us again that it would be just a couple of minutes more. She disappeared. At 7:25, she returned and showed us to our table, which was near several other empty tables which hadn’t been cleared. At 7:35, our server appeared. No water, no bread up to that point. Tables around us still weren’t cleared. Large glass doors were open to the lake view and the occasional mosquito. The food was of uneven quality. Mediocre onion soup, pretty good caesar salad, mushy overdone lobster pasta, flavorful scallops. Not worth the wait or the price. We have dined at Marche Bacchus several times in years past and really liked our experience. This time, it was a disaster - and likely our last time there. Just an amazing place to dine and it was a special Birthday occasion with some friends in town which made it even more special. I chose this restaurant because of the ambiance and the availability of a vegan menu. When I was given the menu which was titled Vegetarian/Vegan I was surprised to see that all three entrees contained cheese. Disappointed. Please review your menu. Vegan involves NO animal products: meat, fish, dairy, poultry. Thanks! Saturday lunch is a very busy time, especially before and after the complimentary wine tasting. The servers were very attentive but very busy. The food is always excellent. 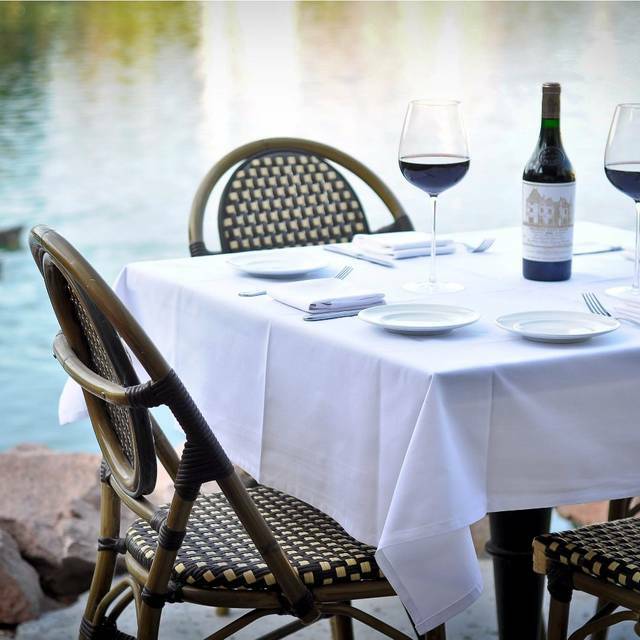 Always a delightful dining experience by the water with good food and wine! It was nice to celebrate Dirk's 10 yr anniversary. Service was excellent - friendly and knowledgeable. Only complaint - black rice risotto and chicken, the chicken breast was dry and the tender still had the inedible vein. That said we will return and look forward to sampling more of the menu and the wonderful and varied wine selections. This is defintely a neighborhood find. Their lunch special is worth the drive! Excellent escargot and lobster croissant. I will defintely return again! Always a great place for Brunch, great food and wine! Outstanding food, service and atmosphere as always! We had a wonderful evening! Nicole, our server was perfect....any requests were honored perfectly. The food was delicious...we both had the duck breast...to die for!! We enjoyed Glenn Nowak, the guitarist/singer and the desserts, a complimentary birthday Crème Brule and a Limoncello Frozen Soufflé (not complimentary) were so fabulous that words do not suffice. The new bar in the wine shop is so stunningly beautiful...cowhide barstools too too great looking....everyone should go to this restaurant at least once!!! Outstanding! Food was delicious, the perfect portions seasoning and timely. Our waiter Ian was the best service my family has experienced in a long time! He was on point with his recommendations and his patience is to be commended. It was my moms 88 birthday and she has an anxiety disorder which cause extreme impatience , he waited on her like she was royalty which made our meal one we will always remember! We will be back for more delicious food and of course our now favorite waiter Ian! Also want to say the prices we thought were very fair due to the freshness and quality of the food. My personal recommendation is the charred octopus appy ( tender as butter) and the Mussel and chorizo entree ( dip that herb bread in the sauce and you will hear Angels sing) my mom had the French onion soup, it’s the real deal, she started speaking French by the time she finished it. LOL! As for the venue... you must go on a nice day and enjoy the water view. I’m sure night is nice too. The decor is comfortable and airy/ open. You will not be disappointed! We love going to Marche Bacchus for weekday lunch and getting their Two course pre set lunch that comes with a comp glass of wine. 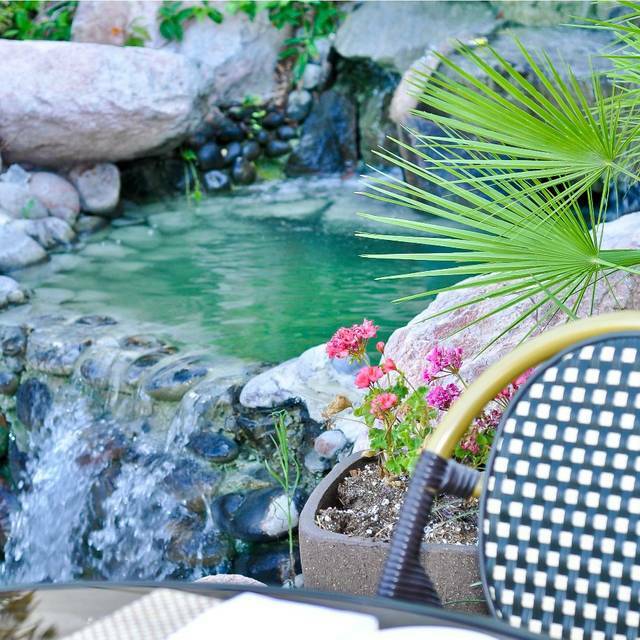 It is a beautiful setting with good food and very good service. What could be bd about that. Each time I have dined at this incredible establishment, I fall in love all over again! The owners are lovely, their staff is amazing and take such pride in the service and experience they provide. The chef is outstanding!!!! My most recent visit was for brunch! EVERYTHING we enjoyed was absolutely delectable!! Ian, our guide (because waiter, server, etc would not do him justice) was the most accommodating, polite, pleasant human I've encountered during a dining experience. He was funny and informative. He described each menu inquiry we made with such descriptive words that he truly transported us to how we would feel if we were actually tasting it. I could go on, but I have to say if you are anywhere near Vegas, you MUST visit. My dinner experiences have been equally phenomenal. The wine is fantastic and the bartender makes an art of each creation. I had a blood mary and I am certain I will never have another this amazing, anywhere! Wonderful scenery on the water. Great service. Nice selection of brunch items. Room to move between tables and very comfortable. Delicious food, wonderful service, and the most lovely ambiance/atmosphere. I adore being on the lake eating brunch. It doesn't feel like you are still in Las Vegas. My only negative is that the bottomless mimosas could be a bit cheaper. $15 instead of $20 would be better. When we first went there about 7 years ago, we had a great experience. Now, parking is a problem. The restaurant was pretty noisy, with several small screaming humans. The outside patio is kind of run down, windows were dirty, the service was just okay. I don't think we will be back. The food was just okay, but there are a lot of other places with better food and service for the price. We did have a nice bottle of wine at a good price. The setting on the water can't be beat. Just like being on a river cruise with ducks floating by. I had the best flat iron steak that I ever eaten. It was tender and the sauce was great. My wife had the forbidden black rice dish and it was delicious as well. Our guest had mussels which he enjoyed. The hot bread with soft butter was also a treat. A great wine selection as well. 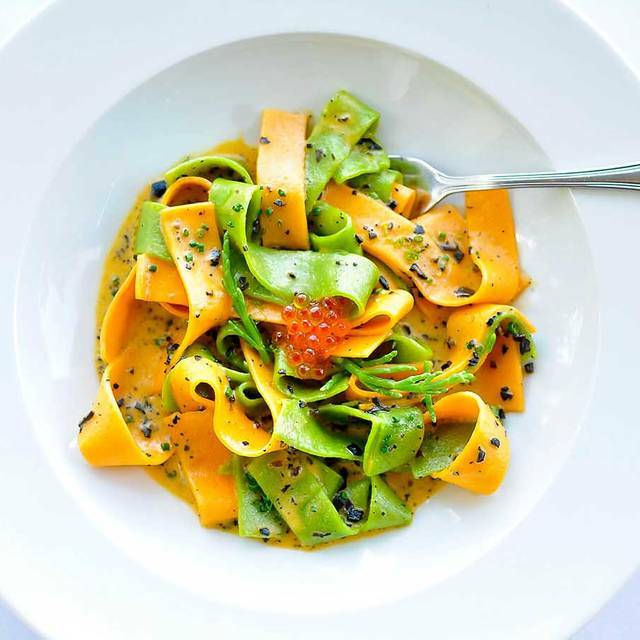 Marche is what fine dining was meant to be. Amazing everything, every time. 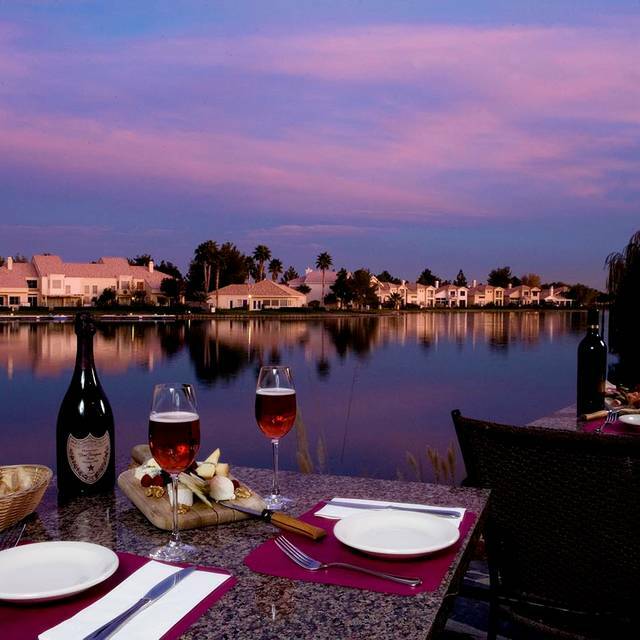 Exceptional food and service, beautiful lakeside views, decidedly upscale but intimidating in any way. And then there is the fabulously curated wine selection—WOW!! Truly one of the top restaurants in Las Vegas. Service way too slow. 1 hour to get the food to the table. Food is always excellent. We had onion soup, lobster tart, lamb chops, bronzino and chocolate mousse. Lovely view of lake and ducks. Fantastic wine selection at reasonable prices. Service was friendly. One blip in service (bringing our entre before we finished our appetizers) was corrected by remaking our entrees. Service was incredible, due especially to an amazing waiter named Vincent. Good food and great service when put together with a killer view and fair prices makes a 5 star place to take your lovely partner. Excellent food and excellent service. The best bistro in the Vegas area by far. Less than marginal service. Good food, poor service. Average wine selection. Curtly informed our reservation was not until 7:00pm upon arrival 20 minutes early. No problem. We sat at the bar, and sat and sat before finally be waited on. No wine recommendations: just what will you have? At 7:35 we were finally seated AFTER several other regulars were seated. Our table was next to a loud wedding party. Service was slow. Since this is actually the garden area - it was COLD. Beware. 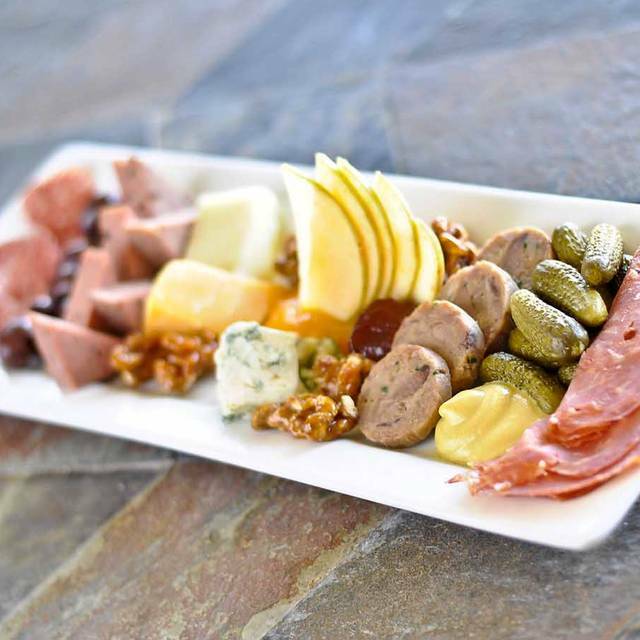 Service: Small plates delivered AFTER appetizers. Dinner utensils served after meals arrived. And when I asked the runner for some water it was as if I asked for his first child. He informed me loudly that he would tell my server who would arrange to have water brought to the table? Really? Never check on us. Small portions, which is fine for me. And delicious food....most of which arrived cold. I am sure for locals this is a great option. However, I will not be back. Anthony was our server and he truly was fabulous! His recommendations were on point, his humor was fabulous, he was willing to talk but not be obtrusive and we never felt forgotten by him. The food was marvelous. The wild mushroom risotto was perfectly cooked but the bistro chicken was even better with the sherry cream sauce and gnocchi. The crime brûlée was so creamy and light. It was a great meal with a great friend. We never felt rushed and definitely enjoyed ourselves. 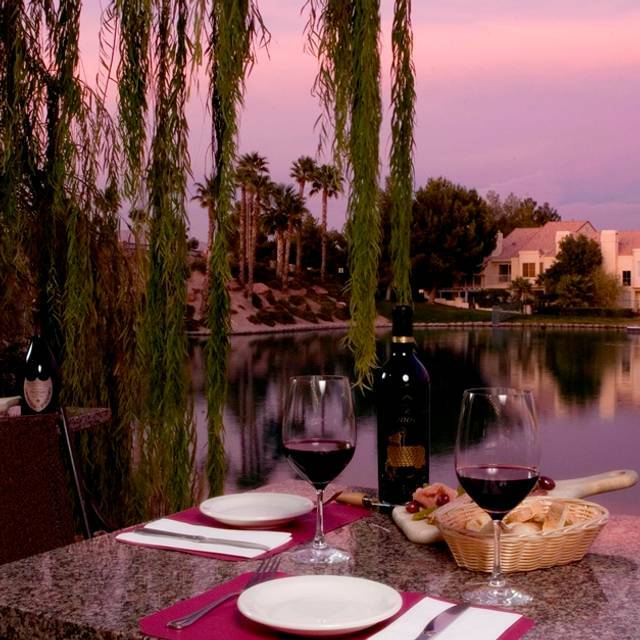 This is a beautiful restaurant with lovely views over the lake at Desert Shores. Due to the glass doors and ample heating sources, dining on the patio is delightful even on a chilly night. The only rub about the ambience is the lighting. It is too bright, and a way needs to be found to dim them in order to maintain the warm and romantic mood. Our food was prepared very well and artfully presented. The scallops with leeks were tasty and perfectly prepared. The bistro chicken was a bit dry. The foie gras was good but not great. The bread pudding was not overly sweet. As there is a wine store in the front part of the restaurant, the selection of wines is outstanding, including by the glass. I usually come here every time I visit Las Vegas (which is often), particularly for the Lobster Croissant, and really the only complaint I have about the place is the loud house (maybe not "house", but such that you'd hear at a club) music that they play; in my opinion, it's completely the opposite of what they should be playing at such a tranquil venue. But maybe this is just how Vegas does things. Otherwise, the experience was great, food was so delicious, wine was perfect, service was outstanding! We enjoyed our meal very much-service was cordial and efficient. We will return. Birthday luncheon, our server was great and the food was delicious. Great hidden neighborhood gem. Food is great as well as the service. Pick your wine from their extensive, reasonably priced wine shop or try their bottomless mimosas. Always a good spot to relax take in the scenary and have a nice meal.